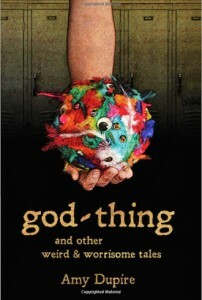 The latest entry to The Methadone List is Amy Dupire’s GOD-THING (AND OTHER WEIRD & WORRISOME TALES). As the title suggests, it’s a collection of short stories, ranging from the evocatively sinister to the outright creepy. Not outright horror… but you can feel a cool breeze blowing on the back of your neck as you read. The Storyteller’s prize is supported by me and my good friend (and wonderful historical novelist) Jack Whyte. All the entries are screened by the conference organizers, and Jack and I judge the dozen or so finalists, which are all sent to us as blind manuscripts— i.e., no author’s name attached. So it isn’t until the banquet at which all the writing awards are announced that we find out who actually wrote the winning story. up, and I got used to hearing her name read out during the banquet. Which in turn led to an interest in what else she might be writing… and ultimately to the welcome publication of god-thing her first collection (her first novel, ALL KINDS OF HELL, is due out later this month). 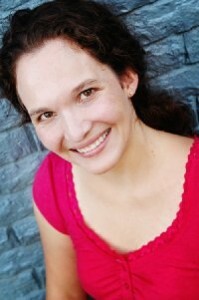 At right, image of Amy Dupire. The stories here are written with delicacy, humor, and a healthy dose of uneasiness. And they are… well, you know… short. <g> Whether you’re in need of a literary appetizer or dessert, immersion or distraction— you might just find what you’re looking for in this collection of "Weird and Worrisome Tales." This page was last updated on Thursday, October 30, 2014 at 8:04 a.m. (PDT).